I used a standard x-brace scheme for my soundboard relying very heavily on Natelson and Cumpiano’s book to help guide me through the construction process. 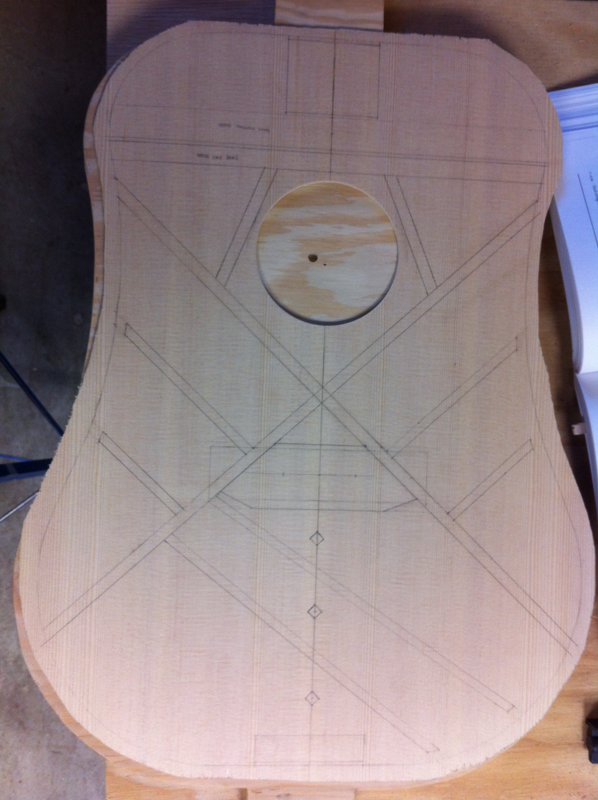 First I drew the outline of the guitar body on the inside face of the soundboard using my template as I had done on the outside face of the soundboard to find the location of the soundhole. Then purely under the instruction of Natelson and Cumpiano’s writing I carefully drew the outline of the soundboard bracing shown below. Finding the position of the bridge so I knew where to put the bridge brace was probably the hardest part, or perhaps scariest part, but other than that drawing out the bracing wasn’t really a big deal. The first piece of bracing that I actually installed was the bridge brace, which I made out of a piece of rosewood, and it was also probably the hardest piece of bracing to install. Cutting out the shape and planing it to thickness wasn’t really hard, but gluing it down exactly where I wanted it to be was, especially since I didn’t have any clamps deep enough to reach it and because I didn’t take the really good advice of Natelson and Cumpiano of making some good clamping cauls before trying to glue down the bridge brace. Because of that my first attempt at gluing down the brace failed miserably – there was a gap between the brace and the soundboard and it wasn’t aligned right with the x-braces. Thankfully I was able to peel it off without breaking anything before the glue dried all the way so I was able to make a second attempt. I eventually came up with the clamping setup below. It worked alright for me, its no replacement for deeper clamps, but if you’re stubborn like me and don’t want to wait for or buy new clamps then perhaps its an okay solution (where I live there’s not much besides the internet for specialized tools and that means at least a couple of days in shipping – if you’re lucky). Also I found that before applying clamps to the brace to hold it in place while the glue dries it helps to first slide the brace back and forth while applying downward pressure with your hands to get the brace to kind of suction stick to the soundboard so when you do apply clamping pressure it won’t slide around uncontrollably and make you really frustrated (I’m pretty sure I got that idea from Natelson and Cumpiano). 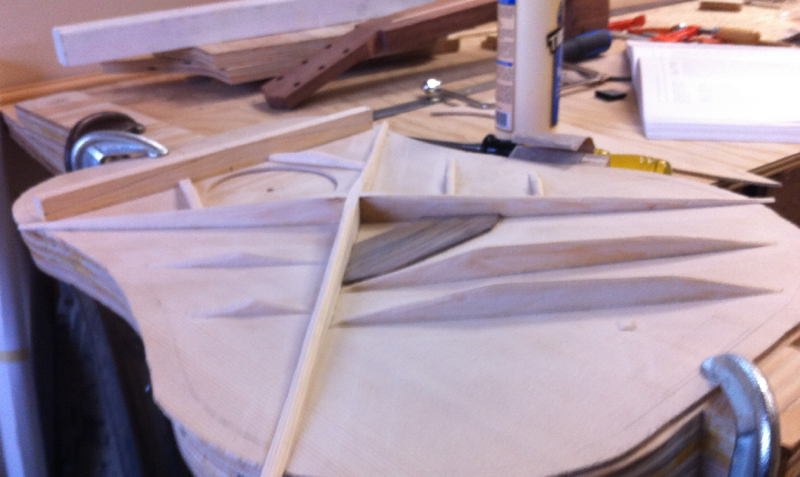 Next I glued on the small finger and soundhole braces. Again I used that same clamping method and it actually worked out pretty well for the small braces. 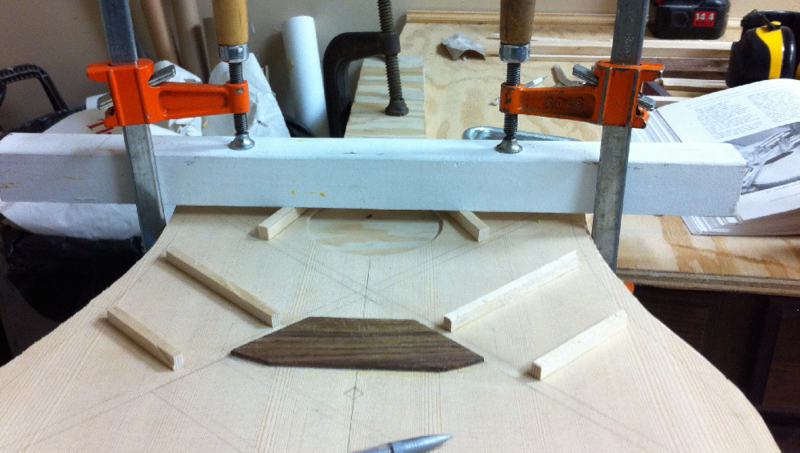 I then glued on a piece of soundboard graph and gave it a nice rounded profile with a hand planer. I also began shaping the finger braces with a 1 inch chisel. I actually really enjoyed this part of it, shaping the braces by hand with a chisel turned out to be a lot easier than I would have guessed and a lot more fun too, the hardest part was trying to not gouge out the soundboard with a miss slip. 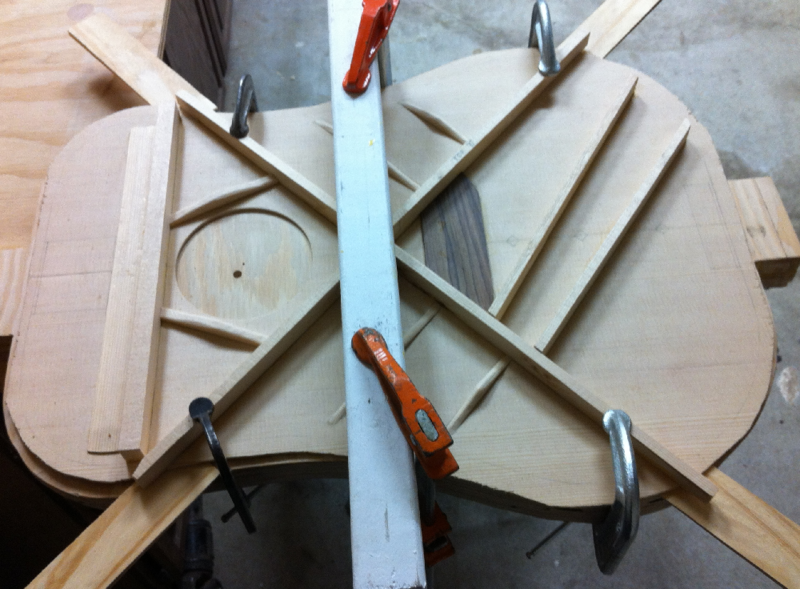 I continued with the bracing by gluing down a rather robust brace above the soundhole as well as the two longer braces coming off of the x-bracing as shown below. Up to this point all of the braces had been flat bottomed, but for these braces and the x-braces I added a radius to curve the soundboard. Actually it wasn’t exactly a radius, it was more of a curve that turns into a straight line at the end points. The mathematics of the curve I do not pretend to understand, but its real life realization is quite easy to produce as it is simply the natural curve that materials like a soundboard or a springy piece of steel assume when bent. And that’s actually how I marked out the curves – with a piece of hardened springy wire. I then used a belt sander with a squared up guide to sand the braces down to the curve. It actually wasn’t too bad, the spruce sanded down relatively easily. Then I cut the slots in the x-braces and made sure they fit in between the rest of the bracing. Finally I glued down the x-braces using the same clamping method I’d used on the other braces. It worked, but certainly there are better ways. With all the braces glued down I finished off the rest of the brace carving through the guidance of Natelson and Cumpiano’s book. 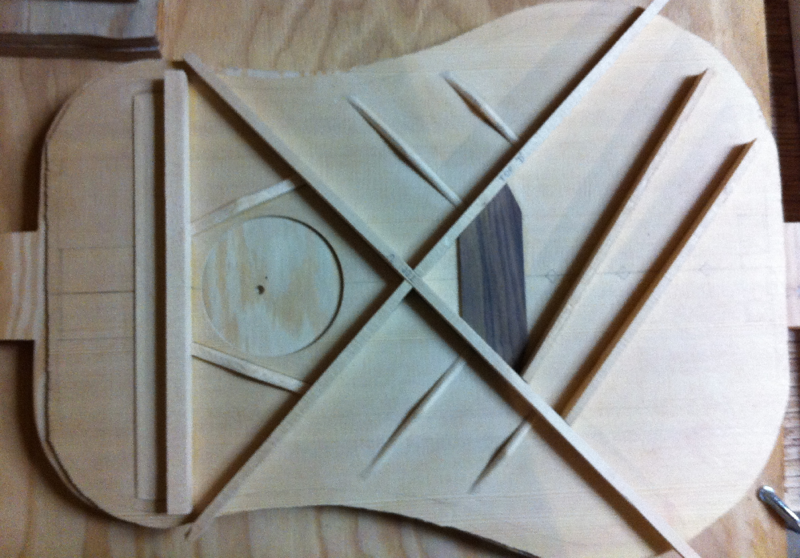 Unfortunately I never got a good picture of the sound board bracing all completed, the photo below is the best I could find, but it does show the basic shape of the braces after I’d finished carving them (except the thick brace above the sound hole which isn’t finished in the picture). 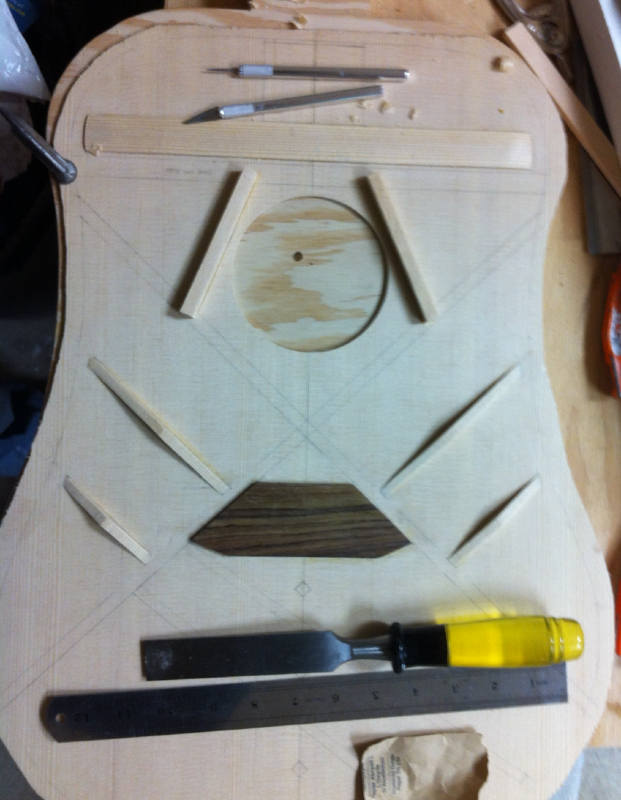 After completing the bracing I moved on to what I think was the hardest part of the whole guitar. 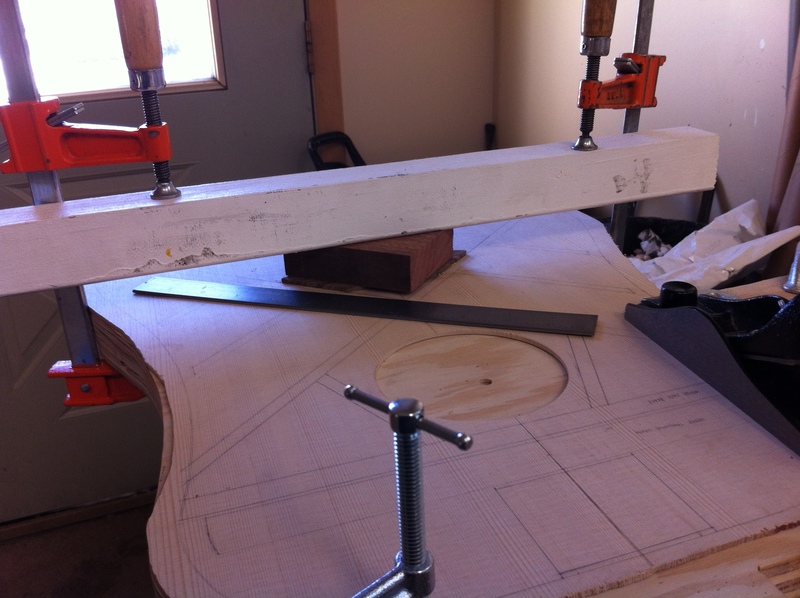 Bending the sides. I also wasn’t too sure how to go about gluing on the curved braces. It would have been ideal to have a curved bowl shaped surface to clamp to, but I didn’t have anything that convinient. I ended up using my flat work board and then sliding some shims under the soundboard (you can sort of see it in the second to last picture on this page). It definetly wasn’t ideal, but it seemed to be an improvement over just clamping the braces flat. Hope that helps. Good luck! Hi, i really like your website, this is the most complete one i have found. For a project at my school, i will build my own acoustic guitar but i have never build a guitar before so i dont understand why we need to shape the brace like that or how i’m suppose to know how to do that correctly. If you have some tips too that would be great. thanks ! Thanks, I’m glad to hear it. About the braces, I’m not sure if you mean why I chose that bracing pattern or why I shaped each brace like I did. But I chose to use the pattern I did based on the recommendation of Natelson and Cumpiano and after reading about different bracing schemes and deciding the x-brace scheme was the one I wanted to use. From what I understand it does a good job of transferring the stress put on the soundboard by the strings to the sides of the guitar which are much better suited to handle those forces, which made sense to me. And as for the shaping of the braces, I did that too based on Nateson and Cumpiano’s recommendations, and from what I understand the idea is to remove as much wood on the brace as possible to keep the soundboard from being to stiff and not being able to vibrate with the strings, but at the same time still maintaining the necessary strength in the braces. It seems more like an art almost to me, though I’m sure a good material/mechanical engineer could figure out something like an optimal solution. Hope that helps! And good luck, that sounds like a great project to me. What about tap tuning. Did u ude it, or do you think it only is a ting u do at very good guitars? I didn’t tap tune any of the wood that I used, and my knowledge about it is so limited I couldn’t offer any useful advice on when it should be done. But now that you mention it I would be curious about doing some frequency spectrum analysis on the woods and experimenting with different woods and thicknesses and stuff. Hi, I am Greg and doing my first Steel String build. I am combining the Xbracing approach with fine lattice bracing. My question is: when I arc the SB side of the X braces, to what dimension do I remove material at the ends. One book says an offset of 1/8″ . Any advice would be great!